Welcome to Interfuture. We provide IT solutions and consultancy to small and medium size businesses across Surrey, Sussex, Hampshire, Kent, and London, as well as larger companies whose head offices are based in the South East. Our flexible approach to IT support means that we are able to work alongside your existing IT department, or offer full service support, depending on your requirements. Our successful delivery and high levels of client satisfaction are based on our 5 point methodology. We work with some of the world’s leading IT providers including Oracle, Cisco, Sage, Microsoft, HP, and Fujitsu Cloud Services. We are also proud to be a Microsoft Small Business Specialist. Our experienced IT Consultants are on hand to help you with specific IT projects and requirements. That could be planning the ideal IT set-up for your business, discussing the benefits of bespoke software development, or offering advice on the security and backup of your IT systems and business critical data. Find out more about our IT Consultancy services here or take advantage of an initial free, no obligation discussion, by calling 0845 5210 822. Our IT specialists will support you while you concentrate on running and growing your business by ensuring that your IT systems are fully functional and meeting your business’ requirements. We can work alongside your existing IT department or we can be your IT department, whatever your needs we can put together a bespoke support package to suit you. Take a look at details of our Service Level Agreements, Help Desk support, and Emergency Cover services to find out more. Communication is at the heart of any business, at Interfuture we can ensure that your communication systems, email and telephone, plus mobile access and working options are set-up to meet your business’ needs. We can offer end-to-end project management and installation from site survey to go live, or simply work with you in a consultative capacity to ensure your communications set-up supports your business. Find out more about the Communications services we offer. Cloud computing has changed the way that we store and access information, and fits perfectly with the globalisation of businesses and their workforce. Its flexibility and mobile access options means that a Cloud model can work for any organisation of any size. Cloud backup services also offer the peace of mind that comes from knowing that you can simply return to the last version of your business critical data should a technology failure occur. Your business will never skip a beat. Find out more about our Cloud computing and backup services. We have a dedicated and experienced team of IT specialists who are on hand to support you with any IT requirements, questions, or concerns you may have. If you are looking for advice on specific technical issues, projects, or information and support for your CRM, Financial Services, or Security Software packages and processes, we can help. We can also discuss your requirements for any bespoke software development so that the software solutions you are using work for your business and increase productivity and efficiency. Find out more about how our IT specialists can help you. As well as having 20 years’ experience in supporting business through a wide range of IT services, we operate from a proven 5 point formula which has left us with many satisfied clients. We are flexible and can work with your existing IT department or, if you don’t have in-house support, we can act as your IT department, offering on-site and off-site support as required. We have an experienced and passionate team of IT professionals and business support staff in place, all ready to support you and your business. We can offer ongoing support or help with larger bespoke IT projects. We don’t provide out of the box solutions, everything is tailored to your exact requirements. Interfuture Systems Ltd specialises in providing a wide range of IT support, consultancy, project management, and software development services to businesses in Surrey, Sussex, Hampshire, Kent, and London. We also work with larger companies with head offices based in the South East. With over 21 years experience in providing IT support to businesses of all sizes, we have developed a range of services which enable us to provide as much or as little support as your business requires. From IT Consultancy to our Help Desk and Service Level Agreements, website and software development, SEO packages, and the design and installation of telephone, internet, and email solutions we offer everything you need. Interfuture has formed close working relationships with clients across the South East and continues to offer competitively priced services that outshine our competitors time and time again. Click here to read a few words from David Williams, one of our directors. We are extremely proud of the team of IT specialists and business support staff that we have in place. Our commitment to excellence and continuing development means that we have been able to attract and keep top talent. From back office staff to our IT Consultants and Directors, we have developed a culture of passion, accuracy, professionalism, and positivity. This filters through into everything we do internally and externally for our clients. Our Accounts and Administration departments are made up entirely of qualified individuals with a shared passion for accuracy and professionalism. We know that our front line operations depend almost entirely on efficient and successful back-end function – which is why we invest in the best people. If you’ve already spoken to one of our Help Desk Operators or Technical Engineers, you’ll have experienced first-hand Interfuture’s successful approach to business IT support. Highly skilled, knowledgeable, and driven experts in their field, our technical team have an outstanding level of experience and IT know-how, and are trained to deliver a jargon-free, approachable, and transparent service to our clients. Our Commercial Department is not simply made up of energetic sales consultants – each member of this expert team have a high level technical awareness that best places them to advise you on everything from new products, to improving your existing IT infrastructure, and how to get the very best from the systems and products that you’re using every day. Just like our technical team, this department shares our jargon free approach to honest IT support and services. Even our Management and Directors embody our 5 point building block structure that makes Interfuture unique, reliable, and most of all, successful. Overseeing flexible operations and building close relationships with clients, Interfuture is steered by a team with years of experience, unbeatable market awareness, and a fresh new take on how best to deliver IT in a modern work place. As well as having 18 years’ experience in helping businesses of all sizes across the South East make the most of their IT systems, we have a team of dedicated and experienced IT specialists in place to support your business. We have developed a simple 5 point building block structure which we follow religiously to ensure that we are delivering consistently high results for our clients. We spend time getting to know your business and requirements. By working with your existing team, we use the foundation of understanding we have gained about your business to build an IT support, services, and consultancy package to meet your needs. We don’t offer out of the box IT services. We are your IT partner and we will build our relationship with you based on this. We work with you throughout the duration of your IT support contract or lifecycle of your IT project to find the best products and services to match both your logistical demands and budgetary expectations. We won’t stop searching, testing, recommending and rejecting until a correct match is achieved, with your feedback and input being the key to our success. We offer flexible solutions. Businesses evolve and change constantly so it’s important that your businesses IT support is flexible to accommodate changes to your requirements. Whether overseeing a relocation, upgrading your existing solutions to meet new demands, or scaling back on IT expenditure, we will work with you to offer continued support that adapts to meet your needs. We want to see you succeed and look forward to growing with your business. We focus on progression and invest in our team and the services we offer to ensure that we are offering the best IT support possible. This investment and desire to develop and evolve is one of the main reasons we build long lasting relationships with many of our clients. We deliver. This is a bold statement to make, but our understanding of your business, its technology, and your requirements means that we will deliver the right IT solutions for you. With a service structure built on understanding, a strong relationship, flexibility and progression, we’re armed with a confidence that we can deliver outstanding results. 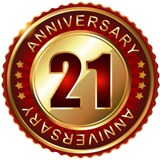 With 20 years’ experience in offering IT support, consultancy and software development, our business has grown, evolved, and adapted to enable us to continue to offer the best services possible. Our brand is no exception. The Interfuture brand now boasts a sleek, no fuss image, synonymous with delivering professional IT services, products, and support to businesses in the South East of England. Having evolved over many years, the Interfuture name overarches its various services and products, delivering a series of sub-brands to easily differentiate the various offerings. As with the rest of the business, we have made considerable investment into our brand and feel that it encapsulates Interfuture as an organisation and IT support partner. The Brighton and Hove Business Show is one of the largest business networking events in Brighton & Hove. Renowned for scores of diverse business support groups, forums, networking groups, and business clubs, having one of the highest ratios per business in the UK, even with so many choices available to local businesses, the Brighton & Hove Business Show is now one of the largest commercially managed, business to business networking events. 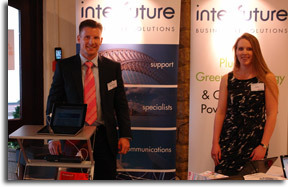 Interfuture Systems Ltd attended the show late in 2010, and attracted a lot of interest from local and national businesses. The visit helped us build networks, raised our profile and helped us return to our office refreshed and inspired. The South East Business Show is a professional event to provide a dynamic platform for businesses to network, make new contacts, share knowledge and learn. 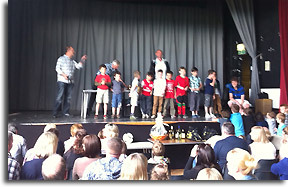 As a successful modern company Interfuture recognise the importance of supporting the community in which we operate. We are immensely proud of our involvement with, and sponsorship of, a variety of carefully chosen charities, and will continue to support those charities that are close the hearts of our team members. Read on to find out more about the charities that we sponsor and how Interfuture are making a different to their outstanding work. Interfuture Systems Ltd is proud to sponsor Help for Heroes. Help for Heroes was founded by Bryn and Emma Parry in October 2007 out of a desire to help the wounded Servicemen and women returning from Afghanistan and Iraq. The message of the charity is simple: Help for Heroes are strictly non political and non critical; we simply want to help. Help for Heroes believe that anyone who volunteers to serve in time of war, knowing that they may risk all, is a hero. These are ordinary people doing extraordinary things and some of them are living with the consequences of their service for life. To promote local charities and reduce Interfuture Systems Ltd carbon footprint, we will not be sending out Christmas cards this year. Our chosen charity, again for this year, will be East Grinstead Access Group (charity number; 107 9603). We are pleased to have donated to this worthy cause and will be supporting their efforts in the coming year. East Grinstead and District Access Group is a local charity run entirely by volunteers. They campaign to achieve, wherever possible, equal rights and access for all people with any form of disability or mobility problems thereby ensuring a more inclusive society with a higher quality of life for all. To achieve this they work to ensure that people are aware of the provisions of the Disability Discrimination Act 1995 in respect of equal opportunities to goods, services and facilities. Their methodologies are by co-operation with local businesses and statutory authorities and include positive action to raise public awareness of disability. 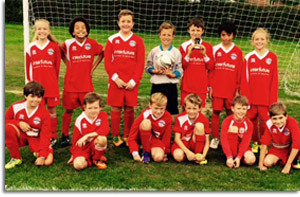 Interfuture Systems Ltd is proud to sponsor the Crawley Down under-7s and under-11s football teams. 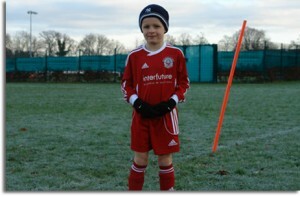 Crawley Down Football Club is heavily involved in promoting football from the young age of 5 years through to adult. There are four adult teams including a Ladies Team, Youth Under 18 Teams and a full range of Junior youth sides starting at 5 years and ranging up to 16 years. 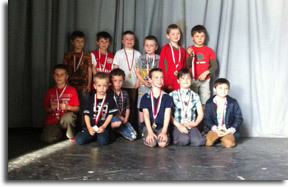 Another successful junior presentation evening at Crawley Down Football Club with over 90 medals and trophies presented to the U5s through to the U15s teams. David Williams, of Interfuture Systems, recently wrote an editorial on the subject of “Cloud Computing and Your Business” in the March/April 2012 issue of the Surrey Business News. “Have you considered ‘Cloud Computing’ for your business? Should you? Is it an inevitable transition technology? David Williams of Interfuture Systems Ltd, an IT Consultancy and Services company, gives his insight into the confusion that surrounds the mother of all acronyms. There’s been a lot conjecture around ‘the cloud’ when it comes to technology and IT in the past few years. Some will insist it’s a revolution as big as the advent of the microprocessor and that the cloud is quickly changing businesses as we know it, forcing it to rethink how it thinks about IT and its delivery in this ever connected world. There is certainly a lot of truth here. But is it for every business – and to what extent? 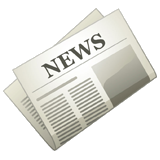 By 2020, one third of all data will reside in, or go through, the cloud (Source: CRN publication 13/02/12). This is an important statistic and one would think that this should be higher given the levels of interest, investment and furor around the whole technology. However, if in eight years this is the suggested level of take-up, does it imply that where an apparent minority of businesses see it as an absolute strategic progression that transforms their operations and saves money, others may not agree and tentatively look to cherry pick elements of ‘the cloud’ into their operation as a hybrid mix of traditional in-house and cloud based solutions? Or could it simply mean the majority of businesses will opt to stay with their on-site setup because it works, and works well? Should your business embrace this technology now and push it on as an inevitable progression to stay abreast with these technological changes? This is the question that vexes a great number of SME businesses who continue to struggle with a fundamental understanding of what it is, what it can deliver and why. In truth every organisation has its own specific needs and requirements – be that remote working, in-house applications (either off the shelf or bespoke), accounts systems either for simple day-to-day accounting or more complex manufacturing processing etc. as well as factoring in the location of the company offices and what level of communications are available. 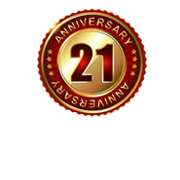 Interfuture Systems Ltd (ISL) has been an established IT solutions provider and systems integrator since 1997. It has a long tradition of service obsession with extensive experience in helping customers optimise productivity whilst reducing their operational and capital expenditure. We assist customers throughout their IT projects lifecycles – from assessment/reporting, solution design, supply, deployment and training through to technical support and disposal. ISL is now seeking a highly motivated sales consultant to push and extend its client base. You will have a good track record with a clear ability to develop a pipeline of opportunities pulling on existing relationships and forging new opportunities through proactive sales development. You will be instrumental in developing on existing sales strategies utilising in-house systems such as Microsoft Dynamics CRM and delivering against our product and services portfolio. • To develop new contracted revenue against product and services portfolio. • To develop existing marketing strategies. • To develop further brand awareness. 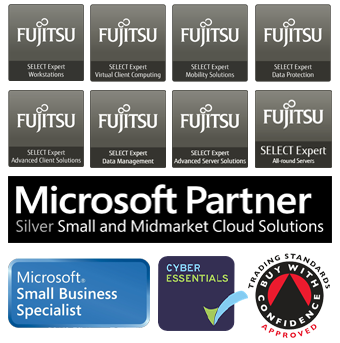 • To work with key partners such as Fujitsu delivering on agreed marketing plans/funding. This is an ideal role for an individual who is already established within IT sales role and has worked for a reseller but is now looking for a next challenge to work and promote an established IT business solutions provider. • Be able to offer potential design solutions to SME client problems. • Excellent at identifying opportunities. • Organised with the ability to multi task. • Account management (consultative business development). • Develop an understanding of the services and products proposition as a basis for business development calls and then secure a similar understanding for all product areas. • Work with the Sales Director to develop further the sales process and campaigns. • Manage the prospecting process. • Carry out telephone and face to face sales activity in line with the agreed sales plan and targets. • Ensure that a consultative sales approach is taken for all activity, providing a value based proposition. • Ensure all proposals are within the pricing parameters provided. • Ensure the technical aspect of all proposals are approved by the technical team. • Communicate and pro-actively work with the Technical Consultants and Technical Support to identify growth opportunities in existing and new customers. • Guide or directly support the Technical Consultants in selling in new or enhanced services to existing customers. • Share information within the business regarding market and customers to maximise business opportunities and performance. • Deliver the sales revenue for new and existing customer growth as set out in the budget. • Field based IT business development. • Development of contracted customers. • Development of existing customers. • Preparing consultative business proposals. £20K – £30K PA (Dependant on experience + competitive uncapped commission + car allowance).